Two major concerns of the existing or prospective homeowner are energy efficiency and freedom from potentially harmful substances. Continental Insulation provides key services to the homeowner in the form of polyurethane spray foam insulation and asbestos removal. From Boiler Replacement to New Construction, Continental Insulation can provide a one-stop commercial insulation solution. Using experienced and skilled insulators, our work is not only functional but also meets the exacting aesthetic standards of public spaces. Energy conservation and efficiency are a hot topic these days with rising heating costs and environmental sensitivity. As such, spray foam insulation has become a major force in any kind of energy conscious construction. Although it's been around almost 20 years, a true understanding of the benefits of spray foam is not pervasive, especially with respect to building code. A recent article in the Toronto Star gives some good perspective on insulation of houses. To read, click here. We are a certified installer of BASF Walltite medium density closed cell polyurethane spray foam insulation. As of January 2010, new legislation requires that all spray applied foam products be non-ozone-depleting. As such, commencing in early November, Continental Insulation will be using the new Walltite ECO. You will know this product by its distinctive colouring � PURPLE! The new Walltite ECO will offer all of the benefits of Walltite with a more environmentally friendly formula. Don't settle for less! Where is spray foam insulation typically used? How does it work? Spray foam Insulation is a relatively new insulating product technology, developing over the past 20 years or so. The driving force behind the spray foam concept is that to properly insulate a space, you need to provide not only insulation value (r-value) but also a true and proper seal against the worst culprits in heat loss: movement of air and vapour. Spray foam very effectively provides all 3 elements. Spray foam has many applications. Typical locations include walls, crawlspaces, attics, cathedral ceilings, hot tubs, above-ground pool enclosures, under a heated or unheated concrete slab floor...the list goes on. The only limiting factor is that spray foam is essentially plastic and will melt/burn so it needs to be protected from heat. See below for a further discussion of this. What is the R-Value of spray foam insulation? If I put a plastic vapour barrier won�t the pink fibreglass insulation do the same thing if I put it in thick enough? It is very important to note that building codes have typically not caught up with technological advances such as spray foam insulation. For building code applications, an R-Value of 6 per inch is the standard. Keep this in mind for your renovation project. Ontario Building Code changed in January 2012 and requirements for insulation have increased. Depending on issue date of your permit, these changes may or may not affect your project. Consult with City of Greater Sudbury Building Services to be certain. I hear that spray foam insulation is a lot more expensive than other types, how do I justify the price difference? I�ve received several quotes for spray foam insulation and they vary quite a bit. Are there different types? Yes. There are different densities available. There are even �do-it-yourself� kits. Continental Insulation recommends 2 lb closed-cell foam. It is more expensive at the time of construction but the payback far outweighs the additional investment. I've done a lot of research and really want to insulate with spray foam but it seems expensive. Can I get the same results if I buy the kit and do it myself? Professional Sprayers are trained and certified. They know how to safely and properly install the product. They will be able to offer a warranty. The kits are also very expensive. The price per board foot for just the material isn't that much different than the cost to have someone do it for you. The larger the area, the less sense it makes to do it yourself. There is a reason (or at least a half-dozen) why professionals should be used to do this kind of work. crawling in confined spaces & 50 years old...a good idea ? All done, and all good. That stuff, without question, blows the blue Styrofoam SM away !!! I am interested in having spray foam insulation installed in my cold room. I�ve been told that if I put a special paint on it that it doesn�t need any other covering to meet building code. Is that true? No. In order to meet building code, spray foam insulation must be covered with a thermal barrier. There is no paint or coating currently suitable for that requirement. A thermal barrier is a material which slows the transfer of heat/flame. Thermal barriers are tested in laboratories under fire conditions to prove they can withstand heat/flame long enough to allow occupants to leave a building safely. There are fire protective paint coatings, but they are designed and tested for steel, not foam. Using any type of paint will not meet Code and therefore, in most cases, means that you do not have insurance coverage. It also means you are putting occupants at risk if a fire condition develops. While spray foam is arguably the best insulating product available, in certain applications it presents some challenges. Cold rooms, corrugated metal buildings and other non-concealed spaces where thermal barrier covering is either undesirable or impractical are typically not able to be sprayed. Typical thermal barriers include drywall and masonry (stone, brick). Spray applied cementitious fire proofing material is also a tested barrier and is very effective in certain situations when there is no risk of impact or where the entire assembly will be covered with metal sheeting. Each situation can be unique and a solution should be discussed with a certified installer. Meeting building code is very important. If your property had a fire and the insurance adjuster discovered a code violation, your claim could easily be denied. Make sure of all the facts before proceeding. Be wary of any contractor that tells you a paint will satisfy the thermal barrier requirement. It will NOT. I live in a 50-year old house and suspect that the walls have very little insulation, can I make a couple of small holes and fill the walls with spray foam insulation? No. BASF Walltite ECO spray foam insulation cannot fill cavities. The product is applied with heat and high pressure from a spray nozzle. When the two liquid parts make contact with the surface, they form and harden almost instantly (about 4 seconds). This creates two possible problems � first, you will have voids in the wall as the foam will not reach all corners; second, as the foam expands in the cavity it is very likely to create a pressure point at the injection point. It would be very likely that the drywall or plaster could be pushed off the stud by the expanding foam. Even lighter density foam can cause this. Be careful when filling cavities! I understand that attic spaces require proper ventilation, but I have a cathedral ceiling that I am redoing. Does spray foam insulation require venting in that situation? How would you do that? Is there a lot of odour when the spray foam insulation is being applied? Does my family need to vacate the house for a certain period of time? I have young children, is there any toxicity we should be concerned with? The foam-forming reaction occurs in seconds and the curing is 100% complete well within 24 hours. Any off-gas is very minimal and completely gone within hours. The odour from BASF Walltite ECO spray foam insulation is about the same as a latex paint but lingers for a much shorter duration. The failsafe precaution for any foam installation is 24 hours. For any person that has asthma, allergies or other respiratory difficulty, as well as young children and elderly persons, vacating for this duration should be mandatory. Once the foam has cured (max. 24 hrs), there will be no further off-gas for the life of the product. The sprayer will secure the spray site to a safe perimeter and ensure the work is done in the safest possible way. In any interior installation, exhaust fans will be set up to vent the fumes. We would be pleased to answer any questions and/or provide detailed technical information about the product, installation procedure and health and safety requirements. I get a lot of ice build-up on my roof and have been told that I don�t have enough insulation in my attic. How can I add spray foam insulation to help that? One of the biggest causes of ice build-up on a house's eaves is leakage of warm air into the attic space. Spray foam insulation's key feature is its ability to effectively seal against this leakage. Theoretically, it would be the ideal product for the attic. In practice, there are some logistical and cost issues. First, as discussed above, spray foam insulation must be applied directly to a hard surface, it cannot be 'blown in' atop another insulating product. As such, in any attic space with existing insulation, that material must be completely removed prior to installing spray foam. The cost of this removal can be prohibitive, though in many retrofit situations, the existing insulation contains asbestos and must be removed regardless. Second, spray foam insulation is expensive. At R-6 per inch, to effectively insulate an attic to R-40, you would need almost 7 inches. For most, the cost would be prohibitive. However, a very successful and effective compromise is to put a base layer of one and half to two inches of spray foam insulation and then blowing or batting up to the desired R-Value. Doing this achieves a rated air and vapour barrier combined with an economical R-Value attainment. How much insulation do I need in my �.? Minimum insulation thickness is decided by building code. Every region has its own code and interpretation. Ontario Building Code has recently changed. Consult your Building Services Department to ascertain if the new standards apply to your project. I am trying to get a rough idea of how much spray foam insulation will cost, how can I estimate that? Record the dimensions of the area to be insulated. Indicate where the area(s) are (attic, basement, crawlspace etc). Also, please indicate the location of the building to be insulated if it outside the City of Greater Sudbury. Provide this information in our handy inquiry form or give us a call at (705) 692-3311. You will receive a reply within the same business day. Obviously it would depend on the size of the job. Generally, for most residential jobs we can be finished in one day. New construction where we are doing an entire house could take up to 3 days or longer. Do I still need a vapour barrier if spray foam insulation is being installed? There is some varied opinion on this point. Spray foam insulation at one and a half inches thick is a recognized vapour barrier. If it is installed between metal studs, there is no need for a vapour barrier. If the studs are wood, some argue that a vapour barrier is needed for the studs because wood is porous. Others would say that the penetration through a 2x6 stud is so minimal that it does not warrant the additional cost of a vapour barrier. In commercial applications, at any material transition point, a sealing membrane is required. For specific questions on your home or to book an appointment, contact us using our inquiry form. Friability of Material � How easily can it be made into airborne particles/dust? Although details are unconfirmed, participant plaintiffs (homeowners) are to receive approximately $600 as compensation for being sold an asbestos-containing material. Actual removal cost for an attic containing vermiculite can range from $10-$15 per square foot � so for a 1,000 square foot attic, the cost can be anywhere from $10,000 to $15,000! Attics tested in the Sudbury area have typically shown asbestos content somewhere between zero (yes, many attics with vermiculite do not contain asbestos) and 0.7%. 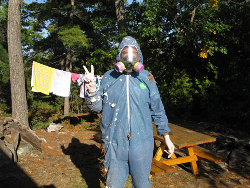 Ontario's threshold for asbestos content is 0.5%. Protection of steel structure in new construction has evolved into a critical element in building design. Fire-resistive coatings and applications are present on most commercial and institutional projects. Installation of these coatings is another of Continental Insulation's primary services. Using experienced and skilled insulators, our work is not only functional but also meets the exacting aesthetic standards of public spaces. Commercial work can be very intricate and involves a great deal of finishing with either metal or PVC. As an example, we were contracted to perform all of the mechanical insulation requirements for the newly constructed Sault Area Hospital. This project took over 2 years to complete and was our single largest contract to date. At the peak of activity we had over 20 insulators on site. 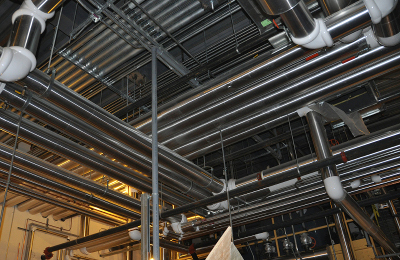 Over 200,000 linear feet of pipe and over 350,000 square feet of duct were insulated! In 2006, Continental Insulation introduced a new service in response to market demand and need � large scale industrial vacuuming. There are a number of other companies that provide these types of services, but none in northern Ontario that offers HEPA standard. This extremely important feature allows us to safely vacuum asbestos and other potentially dangerous particles. Continental Insulation uses an industrial size HEPA vacuum trailer unit to perform safe, rapid removal of hazardous materials. 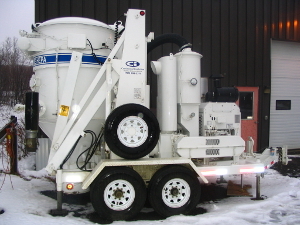 Our unit is the Hurricane 500 from Industrial Vacuum of Wisconsin, USA. Pictured are Continental Insulation employees using the Hurricane HEPA vacuum unit to clean dust and debris from structural steel members after asbestos sheeting removal. 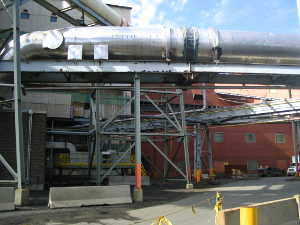 In winter 2006, spring 2007, Continental Insulation was contracted by Anmar Mechanical to insulate a new flue installed at the Vale Inco Copper Cliff Smelter. The new flue measured 6�6� inside diameter and ran for a distance of approximately 1,500 feet. Continental Insulation�s role was to insulate the exterior of the flue and clad with stainless steel jacketing. The flue is situated at a height of roughly 40 feet. Straight sections were done on the ground but most of the expansion joint and elbow work had to be done in place. All of the metal fabrication, including expansion joints and elbows, was done in Continental Insulation�s shop. Over 35,000 square feet of stainless steel was used on this job. 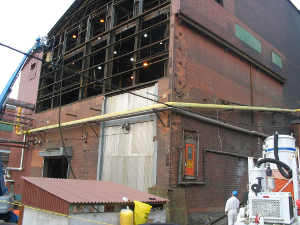 In spring/summer 2007, Continental Insulation was contracted by Vale (Inco) to remove asbestos cement from a 500 ton bin in the matte process area of the Copper Cliff Smelter. The structure requiring removal was 7 storeys high! 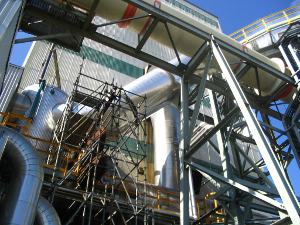 The work involved a complicated scaffold setup and an elaborate asbestos hoarding with floors 1-3 and 4-7 linked together in 2 multi-level enclosures. With over 12 men on the project, it took over a month just to complete the setup. The project was successfully completed in June 2007. This project was a massive undertaking requiring great effort and cooperation. To safely and successfully complete this work is a credit to our employees.